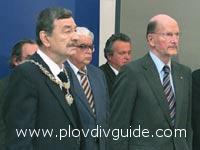 The Culture Minister Stefan Danailov awarded the eminent film director Hristo Hristov for BG Cinema Life Achievement at a formal ceremony at the ?BG Army Theatre? in Sofia. The occasion was the BG Cinema Day, January 13. The Day has been specially appointed as Jan.13th, 1915, the very first BG film ?Bulgaran is a Gallant Man?, directed by Vassil Gendov. The award, won by Hristo Hristov is 5000 BGN. The BG Film Award (3000 BGN) was won by ?Lady Z?, directed by Georgi Dyulgerov. The BG Documentary Award (2000 BGN) went to ?George and the Butterflies? directed by Andrey Paounov, and the BG Animation Film Award (2000 BGN) was given to ?Tic-Tack?, a film by Boris Despotov.